All meals onboard Ghan & Indian Pacific, FREE beverages throughout your journey, FREE toiletries kit, Cabin Steward service, in-cabin music and commentary, use of "Outback Explorer Lounge"
The best time to visit Perth is undoubtedly during wildflower season, where the landscape erupts into magnificent colour. Travel to WA during September or October with this package to experience this remarkable natural phenomenon. There are more than 15,000 species of wildflowers throughout WA - many only found here - such as clusters of splendid rare orchids in the south, prolific inland carpets of everlastings as far as the eye can see to colourful roadside kangaroo paws. Book now to save. Katherine Gorge National Park is home to some of the Katherine region's most diverse and rugged beauty, towering gorges, lush rainforest and misty waterfalls, explore the rich indigenous culture of the region with one of the Aboriginal Jawoyn people and discover some of the amazing rock art sites that dot the National Park. Today you will visit the Adelaide River War Cemetery before a Katherine Gorge Cruise on your way to your accommodation for the night in Katherine. Following breakfast, travel south along the Stuart Highway to the Adelaide River War Cemetery. Continue through Katherine to Nitmiluk National Park and enjoy a cruise in the gorge while looking out for wildlife and learn about the history and culture of the Jawoyn people, the Traditional Owners of the land. Return to the Knotts Crossing Resort for dinner and the night. Breakfast, Katherine Gorge Cruise, Dinner, Overnight Accommodation. The Ord River is one of Western Australia's most beautiful waterways, situated in the remote Kimberley region, this mighty river is home to a wonderful array of wildlife such as rock wallabies, crocodiles and a plethora of different bird species, popular activities here include boating, fishing, cruising, swimming and jet skiing. Drive from Katherine to Kununurra, stopping at the Durack Homestead Museum before cruising down the Ord River on your way to Kununurra for two nights. Travel South West from Katherine to Kununurra. Visit the Durack Homestead Museum at Lake Argyle then enjoy a leisurely cruise down the Ord River from Lake Argyle to Kununurra before dinner. Your accommodation for the next two nights is at the Kununurra Country Club Resort. Breakfast, Durack Homestead Museum Tour, Ord River Cruise, Dinner, Overnight Accommodation. Kununurra is set amidst the vast and ruggedly beautiful surrounds of Western Australia's Kimberley region, this small but busy town is the perfect hub from which to explore the wonderful attractions that abound here including Lake Argyle, Lake Kununurra, Diversion Dam and Celebrity Tree Park, natural attractions include gorges, rivers, waterholes and valleys. Enjoy a tour of Kununurra and Mirima National Park before a free afternoon and a signature dinner at the Kununurra Sandalwood Factory. After breakfast take a tour of Kununurra town today. Your tour includes a visit to Mirima National Park, which is of great cultural significance to the Miriwoong people and is also home to a large variety of wildlife. Later, view the town from Kelly’s Knob lookout before enjoying a free afternoon to relax. This evening enjoy a privately hosted dinner at the Kununurra Sandalwood Factory. Enjoy a presentation by a Sandalwood expert and learn about this intriguing industry. Breakfast, Kununurra City Tour, Special Private Dinner, Overnight Kununurra Accommodation. The 660 km long Gibb River Road takes you on an adventure through definitive Australia, red earth, ochre gorges and rock formations, vast savannahs, spectacular ranges and magnificent rivers, a journey through a remote and ancient land, immerse yourself in the beauty of nature as you spot for rare and unique species of indigenous Australian wildlife. On your way to El Questro, visit the Hoochery Distillery famous for its Ord River Rum before travelling to Parry Lagoons Nature Reserve. Travel down the Gibb River Road to El Questro Wilderness Park for your two night stay at Emma Gorge Resort. After breakfast, we travel to the Hoochery Distillery, the only rum distillery in Western Australia. Enjoy morning tea at the distillery, famous for its Ord River Rum Cake. Continue on to Parry Lagoons Nature Reserve (weather permitting) to variety of birdlife in this region. Visit Marglu Billabong, an important feeding and breeding area for waterbirds. Continue down the Gibb River Road to El Questro Wilderness Park for dinner and two nights at Emma Gorge Resort in your safari style tented cabins. Breakfast, Hoochery Distillery Tour, Morning Tea, Dinner, Overnight El Questro Accommodation. El Questro Wilderness Park and Homestead lies in the ruggedly beautiful Kimberley region of Western Australia, the park is vast, measuring over one million acres in size and is largely unexplored, it's one of Australia's last true frontiers offering visitors excitement and adventure, a helicopter flight over this remote landscape is the best way to get a sense of its size. Travel across the Pentecost River for a gorge cruise. Enjoy a free afternoon to do as you please and this evening, enjoy dinner and entertainment at the resort. Enjoy breakfast on the resort’s large verandah before travelling across the Pentecost River for a cruise along the Chamberlain Gorge. Spend some time at the station before heading back to Emma Gorge Resort. Enjoy a free afternoon before dinner and drinks at the resort with local entertainment. Breakfast, Chamberlain Gorge Cruise, Dinner, Overnight El Questro Accommodation. Situated in the remote East Kimberley region of Western Australia, the Argyle Diamond Mine has been in operation since 1983 and is the largest single producer of diamond's in the world, one of the most technologically advanced mines in the world it produces over 90% of the world's pink diamonds and a large proportion of rare blue diamonds. Visit the Argyle Diamond Mine, the world’s largest producer of natural coloured diamonds. Continue to Halls Creek, rich in Aboriginal and European history and culture and on the edge of the Great Sandy Desert for the night. After breakfast, travel to the Argyle Diamond Mine at the traditional Barramundi Dreaming site at Barramundi Gap. Join a local Indigenous Guide for a behind the scenes look at the diamond mining process and the cultural significance of the site. Continue to Halls Creek for the night at the Kimberley Hotel. Breakfast, Argyle Diamond Mine Tour, Lunch, Dinner, Overnight Accommodation. Geikie Gorge, located in Geikie Gorge National Park is part of an ancient landscape, the mighty Fitzroy River has over time, cut a 30 metre gorge through a bed of limestone which was part of an ancient reef creating a majestic gorge which towers of the water, the contrast between the gorge's multi coloured bands against the blue sky is breathtaking. Travel through the Kimberley to the township of Fitzroy Crossing for the night. Visit the Yiyili Indigenous Community and enjoy a cruise through Geikie Gorge formed by the Fitzroy River. After breakfast, travel through the Kimberley towards Fitzroy Crossing. Stop at the Yiyili Indigenous Community in Louisa Downs. Meet some of the residents at Laari Gallery, an art gallery in the community. After lunch, cruise down Geikie Gorge in the Napier Range. After dinner retire to the Fitzroy River Lodge for your overnight accommodation. Breakfast, Yiyili Indigenous Community Tour, Lunch, Geikie Gorge Cruise, Dinner, Overnight Accommodation. Located 222 km north-east of Broome, Derby is a small outback town rich in indigenous culture, attractions include close proximity to the amazing Horizontal Falls and Windjana Gorge, the incredible Wandjina art-work at the Mowanjum Aboriginal Art & Culture Centre, Old Derby Gaol, the Boab Prison Tree and The 'Pigeon' Heritage Trail. Journey to Derby and see the Boab Prison Tree on your way to Broome. Depart for Broome after breakfast and stop at Derby to see the famous Boab Prison Tree said to have been used as overnight holding cell for indigenous Australians on their way to Derby for sentencing. Arrive in Broome and relax before dinner at the Cable Beach Club Resort and Spa, your home for the next two nights. Pearl Luggers, located in the heart of Broome's bustling Chinatown offers a fascinating insight into the town's pearling history, learn of the dangers and perils the pearl divers faced and see fascinating artefacts and diving equipment, visit two of the last surviving lovingly restored pearl luggers and hear stories of the hardy men who crewed them. Marvel at the beauty of Roebuck Bay as you take an exhilarating hovercraft tour over sand bars and expansive tidal flats, skimming emerald waters and catching sight of Broome's glorious coastline, walk amongst the remnants of Dutch WWII Catalina flying boats destroyed by the Japanese and see perfectly preserved dinosaur footprints at low tide. What better way to see the beautiful surrounds and legendary sunsets of Broome's Cable Beach than from a camel expedition, as you make your way across the pure white sands the rhythmic pace soothes you as you gaze in awe at molten gold sunsets and the sheer beauty of this magical place as the lowering sun casts iconic camel shaped shadows across the sands. Today enjoy a tour of Broome township and then choose from three included half day tours. After seeing the sights of Broome on your city tour, choose from a variety of included day tours. You have the choice between (i) a Pearl Luggers tour, where you can learn about early pearling and see two restored pearl luggers, (ii) experiencing a Hovercraft flight over Roebuck Bay to see the sights of Broome’s coastline or (iii) an iconic camel ride on Cable Beach. The choice is yours! Breakfast, Choice of Included Sightseeing, Overnight Accommodation. Western Australia's Pilbara Region is bestowed with a wealth of stunning natural beauty, an ancient landscape of towering gorges, deep canyons, serene plunge pools and sensational coastal landscapes with hundreds of islands complete with white sand beaches, the region is dotted with fascinating Indigenous rock art paintings and archaeological sites. Depart Broome this morning for the Pilbara town of Port Hedland which is a major hub for the Australian economy. Travel South from Broome to the Pilbara region, famous for it’s diverse landscape and vast mineral deposits. Skirt the edge of the Great Sandy Desert, see large pastoral leases and cross Aboriginal homelands through Pardoo before reaching your overnight accommodation in Port Hedland. Delve into the depths of the Pilbara on your way to Karijini National Park in the Hamersley Ranges. Travel East from Port Hedland to your overnight accommodation at Karijini Eco Retreat. Experience the wilderness in your safari style permanent eco tents. Enjoy a relaxing evening at your own pace before retiring for the evening. Karijini National Park's astounding wealth of natural beauty makes it a must see destination, dramatic and rugged ochre gorges, misty waterfalls and pristine rock pools are just some of nature's delights waiting to be sampled here, the park is home to an abundance of plants and wildlife including red kangaroos, echidnas and rock wallabies. Today explore Karijini, before travelling to Tom Price and touring an Iron Ore mine. Experience Karijini’s spectacular landscape of gorges, waterfalls and pools that are a stark contrast to the red dirt of the Pilbara. Visit Fortescue Falls at Dales Gorge and walk to one of the park’s plunge pools, travel to Tom Price and visit Rio Tinto’s Open Cut Iron Ore Mine site. See the huge machinery in action before retiring to your overnight accommodation at the Tom Price Hotel Motel. Breakfast, Lunch, Guided Tour of Rio Tinto Open Cut Iron Ore Mine, Dinner, Overnight Accommodation. Exmouth attractions include the largest fringing reef in Australia, Ningaloo Reef, with it's crystal clear waters and exquisite coral gardens, the rugged gorges of Cape Range National Park, amazing wildlife and wildflowers and 50 km of pristine white sand beaches, swim with giant whale-sharks, cruise along Yardie Creek and gaze in awe at sensational Indian Ocean sunsets. Today, travel back towards the North West Cape to Exmouth. Experience breathtaking views of the bay and a tour of Exmouth, before reaching your accommodation for the night. This morning head west towards Exmouth located on the boundary of the Cape Range National Park and the Ningaloo Marine Park. Visit the Vlamingh Head Lighthouse for stunning views of Lighthouse Bay, experience a tour of Exmouth township and stay at the Novotel Ningaloo Resort overlooking Exmouth Gulf. Tonight enjoy an included dinner with wine. Breakfast, Exmouth City Tour, Lunch, Dinner, Overnight Accommodation. Ningaloo Reef is one of the world's great diving and snorkelling locations, this ocean paradise on Western Australia's Coral Coast teems with an abundance of wonderful marine life including turtles, dugongs, manta rays and clown fish, swim with the world's largest fish, the whale shark and dive through coral lagoons and vibrant coral gardens. Today discover the diversity of the World Heritage Listed Ningaloo Reef on a glass bottom boat cruise before travelling down south to Carnarvon for the night. After breakfast, take a one hour glass bottom boat cruise over Ningaloo Reef in Coral Bay, stop for lunch (own expense) and continue on to Carnarvon for your included dinner with wine and your overnight accommodation at the Best Western Hospitality Inn Carnarvon. Shell Beach lies in the beautiful Shark Bay World Heritage Area of Western Australia, the beach is made entirely of billions of tiny snow white shells that stretch for 120 kilometres and reach a depth of ten metres, the contrast of the brilliant white shells against the cerulean sky and turquoise ocean waters is simply sensational. Depart Carnarvon and visit the Stromatolites and Shell Beach before reaching Monkey Mia, your home for the next two nights. After breakfast, travel south to Monkey Mia. Stop at Hamelin Pool and see the Stromatolites, continue to Shell Beach, one of only two in the world, and continue to the Monkey Mia Dolphin Resort for dinner, your home for the next two nights. Breakfast, Shell Beach Tour, Dinner, Overnight Accommodation. Monkey Mia offers an unforgettable opportunity to meet a wild but friendly pod of bottlenose dolphins in their natural environment, as these delightful creatures swim close to the shore in the bays clear waters lucky visitors are invited under supervision by rangers to feed and touch them in what is a magical wildlife encounter. Watch the famous wild dolphins of Monkey Mia and enjoy a leisurely day at your own pace. Choose from various optional excursions today. The choice is yours. After breakfast, watch the famous wild Monkey Mia dolphins swim to the shore (not guaranteed). Enjoy a free day to spend however you like. Breakfast, Monkey Mia Dolphin Interaction (Not Guaranteed), Optional Shark Bay Scenic Flight, Optional Wildlife Cruise, Overnight Accommodation. Laid-back Kalbarri boasts the perfect climate to enjoy the great outdoors, surf, swim, sail or fish the azure waters off the beautiful coastline, hike the dramatic gorges of Kalbarri National Park and gaze at the majesty of nature from sensational lookouts such as Nature's Window, wildflower season turns the region into a dazzling kaleidoscope of colour. Travel to Kalbarri National Park to see the gorges, cliffs and seasonal wildflowers before continuing down south to Geraldton for the night. After breakfast this morning, view Kalbarri National Park’s cliffs and gorges from Red Bluff Lookout and Hawks Head Lookout. The National Park is in bloom during the wildflower season with a variety of wildflowers. Continue to Geraldton and the HMAS Sydney Memorial for the night at the Mantra Geraldton. Breakfast, Kalbarri National Park Tour, HMAS Sydney Memorial Tour, Overnight Accommodation. The moonscape scenery of the Pinnacles Desert is sprinkled with thousands of limestone pillars, reaching up to 4m tall, these mystical stones rising from rippled sand dunes create an almost surreal sight, varying in size and shape these mystical rocks are best viewed at sunrise or sundown when the light casts spectacular long shadows over the eerie yellow sand dunes. Continue on to the Pinnacles Desert then Yanchep National Park before arriving in Perth for dinner and overnight accommodation. Travel to Nambung National Park and visit the Pinnacles Desert before stopping at Lancelin. Continue to Yanchep National Park and enjoy an Aboriginal experience complete with touching traditional Aboriginal tools. Continue to Perth for dinner and your overnight accommodation at the Travelodge Perth. Breakfast, Pinnacles Desert Tour, Aboriginal Cultural Experience, Dinner, Overnight Accommodation. Located on Australia's west coast on the shimmering Indian Ocean the friendly city of Perth is Australia's sunniest capital city, modern, vibrant and cosmopolitan the city blends effortlessly urban chic with a laid back outdoor lifestyle, attractions include Kings Park, sensational white sand beaches, the Swan River and the nearby port city of Fremantle. The iconic Indian Pacific transports you in style and comfort from coast to coast across the vast and beautiful expanse of Australia, this 4300 km epic adventure invokes the romance of long distance rail travel, the green hues of the fertile Avon Valley give way to the ancient treeless plains of the Nullarbor and the majestic Blue Mountains on the approach to Sydney. See below for full details on your Indian Pacific journey. 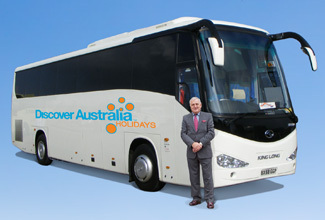 Note: passengers disembarking in Adelaide leave on Day 24. 3 Nights Gold Service Cabin on the Indian Pacific (2 Nights to Adelaide), 3 Breakfasts, 3 Lunches, 3 Dinners, Luxury Kalgoorlie Coach Tour, Luxury Adelaide Coach Tour, Luxury Broken Hill Coach Tour (Perth to Sydney customers only). Relax in your private Gold Service Cabin and watch the landscapes of Australia pass by through your large window. Enjoy all meals onboard the Ghan & Indian Pacific in the stylish Queen Adelaide Restaurant Car (flexible times, hearty breakfasts, two course lunches, three course dinners). Your package includes FREE soft drinks, beers, high-quality standard wines, base spirits, tea and coffee throughout your journey on board. You will also receive a FREE toiletries kit. You have Cabin Steward service, in-cabin music and detailed journey commentary (available from your cabin sound system) and you will love the cosy but exclusive atmosphere of the Outback Explorer Lounge. Your package includes Gold Service but can be upgrade to Platinum Service. You will be transferred from the Ghan railway station on arrival in Darwin to your Darwin hotel. 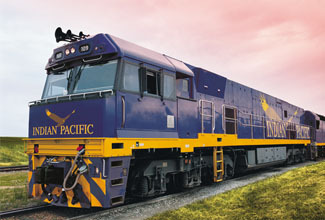 You will also be transferred from your hotel to the Indian Pacific railway station for your journey home. You’ll receive the FREE DISCOVER AUSTRALIA Bonus Voucher Book that includes $500 value of discounts and bonuses throughout Perth and WA and Northern Territory at shops, restaurants attractions, wineries etc. 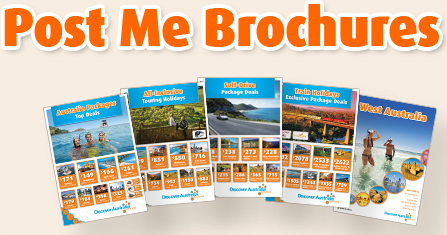 It’s a great way to save even more on your Western Australia and Northern Territory holiday. The beautiful city of Perth is fringed by the Indian Ocean and the Swan River. It has spectacular beaches, a friendly welcoming ambience and a laid back lifestyle dominated by its seemingly perpetual sunny climes. Chic and stylish, Perth effortlessly combines this beach-outdoor lifestyle with its modern, urban big-city feel. You'll marvel at the spectacular cityscapes from beautiful Kings Park, and enjoy the balmy waters of the Indian Ocean at the world-famous Cottesloe beach. Fremantle's historic colonial streets pulsate with the energy of street-performers and buskers, couples walk hand-in-hand through its colourful and lively markets. The lively street cafes and restaurants along it's famous 'cappuccino strip' are perfect resting places to indulge in a spot of people watching. Breakfast, Luxury Day Tour with Hotel Pick-Up, Overnight Perth Accommodation. Upgrade to Platinum Service to join a select group of passengers that will experience the very best in luxury train travel onboard the Ghan & Indian Pacific including the new and exclusive Platinum Club Car. The indulgent Platinum Service cabins are nearly twice the size of Gold Service cabins and come with premium fittings. The large panoramic windows give you the best seats onboard the Ghan & Indian Pacific plus you have an interior window to give you views of both sides of the train at the same time. During the day, your cabin will be configured as a private lounge, with deluxe lounge seating, a table and two ottomans. By night, it is converted to a comfortable bedroom, with either a double bed or twin beds. Platinum Upgrades start at $2990 per person. All packages can be upgraded to include luxurious Platinum Service, simply ask. 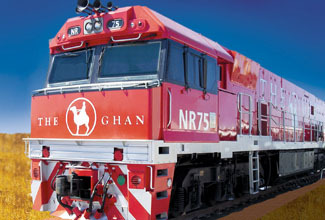 The Ghan & Indian Pacific with Darwin, Kimberley, West Coast & Perth Luxury Touring is very popular. Many dates book out well in advance, please book soon.